The United States relentlessly pushed its frontier westward during the 19th century in pursuit of Manifest Destiny, steadily populating vast swathes with a relentless stream of new arrivals who upped stakes and abandoned their homes in pursuit of dreams of greener pastures and a fresh start in the American West. Unsettled frontiers tend to attract a disproportionate number of single young men, eager for adventure and new horizons, rowdy, rambunctious, restless, and in the absence of the social restraints typically imposed by families and neighbors in more established communities, frequently lawless. Such was the case in the Old West, where many years often elapsed between the settlement of new communities, and their settling down into the rut and norms of established civil society. In such a fluid and volatile environment, it took decades to establish effective law and order and finally tame the Wild West. In the meantime, the region saw a boom in banditry as violent criminals, many of whom frequently transitioned from outlaws to lawmen and back again, crossing and recrossing that line multiple times during their lifetimes, gave in to the temptation of easy riches in a region abounding with readily portable wealth, be it cash, gold, cattle or horses. Stagecoaches became a primary target for outlaws before the arrival of the railroad, because they frequently transported valuables and payrolls in their strongboxes, and required relatively little effort to rob aside from the robber’s audacity. More importantly, they could be halted in isolated locales, giving the robbers time to flee before law enforcement arrived and attempted to track down the culprits. The arrival of the railroads added another lucrative target, albeit a more labor intensive one, requiring teamwork from a sizeable outlaw gang to subdue an entire train in order to rob its hold and passengers. And throughout, banks were a standby target of choice. 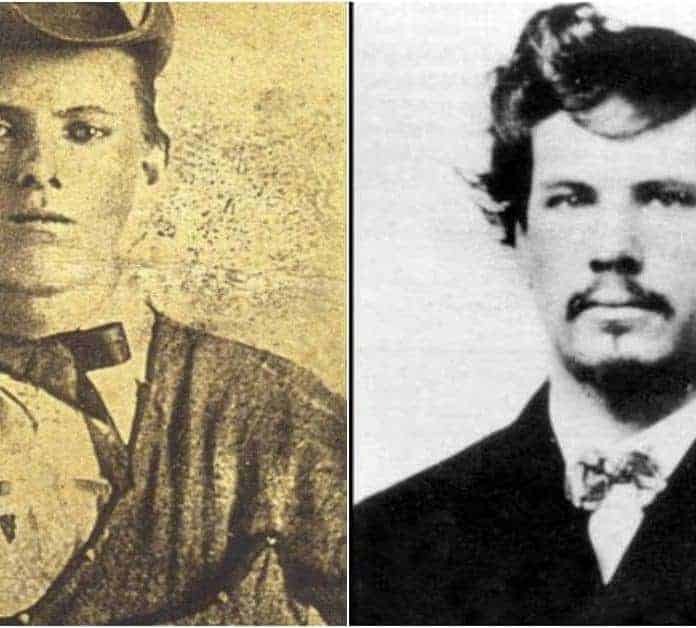 Following are 12 notorious outlaws who operated in the heyday of the Wild West. Charles Earl Boles, AKA Black Bart (1829 – after 1888) was born in England, before his family emigrated to New York in 1831. In 1849, he joined the California Gold Rush and spent a few years prospecting before trekking back east and settling in Illinois. During the Civil War, he enlisted in an Illinois regiment and proved a good soldier, getting promoted to Company First Sergeant within a year, and was brevetted as a lieutenant before his discharge in 1865. After the war, Boles returned to prospecting for gold, but in 1871, had a run in with Wells Fargo agents that left him vowing vengeance. He proceeded to exact his revenge by changing his name to Black Bart, after a character from a dime novel, and taking up a career as a highwayman, specializing in robbing Wells Fargo stagecoaches in northern California and southern Oregon. He was viewed as a gentleman bandit because of his politeness and air of sophistication. He robbed on foot, wielding a double barreled shotgun and clad in a linen duster and bowler hat, his face concealed by a flour sack with eyeholes cut into it. Halting the stagecoach, he would cover the driver with his shotgun while politely ordering him to throw down the strongbox. That done, he would order the driver to move on, then recover the strongbox and abscond. He never fired his weapon, and sometimes left behind handwritten poems, which further enhanced his notoriety and gained him the nickname “Black Bart the Poet”. Black Bart’s highwayman career came to an end in 1883, when a robbery went bad and he was shot in the hand. Fleeing, he dropped some personal items, including a handkerchief with a laundry mark. Wells Fargo detectives then canvassed San Francisco laundromats until they found the right one, and from it learned the identity of the handkerchief’s owner. Under interrogation, Black Bart eventually confessed to robbing Wells Fargo stagecoaches, but only before 1879, on the mistaken assumption that the statute of limitations had run out on robberies committed before that year. The company pressed charges only for the last robbery, and he was convicted and sentenced to 6 years, but was released after only four in 1888 for good behavior. In poor health, Black Bart did not return to his family, but he did write his wife that he was depressed and wanted to get away from everybody. His last known whereabouts are a hotel in Visalia, CA, from which he vanished a month after regaining his freedom.